The awning window is a modern, energy efficient top-hinged window that is a smart choice for a replacement specialty window. It allows great ventilation, even when it’s raining, and comes with a removable screen and a folding crank handle. Enjoy the versatility of a custom awning window as an excellent choice for a kitchen, bathroom, or even above a doorway. Full interior fibreglass spring-loaded screen that makes for easy removal. Low emissivity (Low E) glass that provides maximum energy efficiency & argon gas for optimum efficiency. The three weather seals give optimum guard against drafts and heat loss. 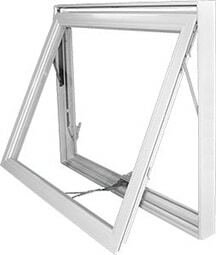 Awning sash unclips from the entrygard allowing the sash to freely tilt outwards to make exterior glass easy to clean from the inside of the home, or in a means of escape. Multi-point locking system on two levers.